Where pain is persistent, save an infected tooth from extraction with a root canal therapy. Root canal treatment involves the removal of infected nerve tissue from a tooth. The infection may enter the tooth through decay, cracks, deep fillings or gum disease. Root canal therapy aims to save infected teeth from extraction – which would be necessary without treatment. 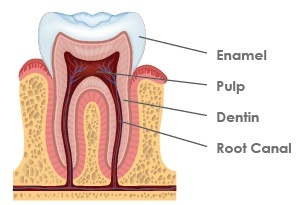 The term ‘root canal’ comes from the process of cleaning the canals inside the tooth’s root. In most cases, root canal treatment follows a straightforward process over two to three appointments. If your dentist suspects you may need root canal treatment, x-rays are the first port of call. Whether it is taking new x-rays or examining existing ones, these will show where the issue is located. Local anaesthesia is administered to the affected tooth and surrounding areas. This ensures the process is no more painful than a dental filling! Called a ‘pulpectomy’, an opening is created to allow the dentist to remove the affected dental pulp. The cavity is filled, and sealed with a filling or crown to restore form and function. Depending on the severity of the damage, either a white filling or dental crown will be placed over the site. A dental crown in particular will maximise the strength, durability and appearance of the tooth in question. Contrary to popular belief, root canal treatment is rarely more painful than getting a filling. Most pain can be attributed to the infection itself, not the root canal therapy. In fact, root canal therapy seeks to eliminate the pain. If you experience anxiety at the thought of undergoing dental work due to fear of pain, speak to the professionals at United Dental Clinic about your sedation dentistry options. We offer oral sedation and IV sedation methods to ease your dental anxiety, so you can get the treatment you need. Most root canal treatments are successful at saving the infected tooth and eliminating pain. More often than not, a root canal proves to be a long-term solution; the assumption the treated tooth will eventually need to be extracted is false. With experience and expertise on our side, you can be confident in choosing United Dental Clinic for your root canal therapy. Call now to book a consultation appointment and be rid of pain sooner!